Did you know that you can make money with Dreamhost Webhosting rewards program? Anyone who has Webhosting with Dreamhost is immediately part of the Dreamhost affiliate program. You can earn rewards by giving people your Email address or create a coupon code for them to enter. Dreamhost offers you two ways to earn money. 2) Choose to just get a $97.00 one-time payment (plus $5 for sub-referrals!) per referral. I think I prefer to receive the $97.00 one time payment because that’s equivalent to someone staying with the webhosting for 10 years. I rather get the payment all at once. Of course, if the person you refer purchases more goodies with Dreamhost, then you get more commission. Another thing is that if you create your own promo codes, the amount of discount you give out, it’s taken off your 97.00 one time payment. So, in a way, you decide how much commission you decide to get. You can earn money when you have a Dreamhost webhosting account. 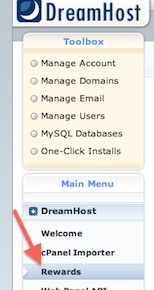 When you signup for dreamhost webhosting, you immediately get an affiliate account. Here you will see the message detailing your Dreamhost Rewards program. Refer friends and loved ones (even strangers) to DreamHost, and earn cold hard cash! Enters that happpy@gmail.com referred them when they sign up. Uses a promo code that you created when signing up. Clicks http://www.dreamhost.com/r.cgi?1020893 and then signs up without entering any promo code or referrer. And how much will you earn? You decide! Either get 10% forever of everything your referrals (plus 5% for people they refer!) spend on hosting with us, or choose to just get a $97.00 one-time payment (plus $5 for sub-referrals!) per referral! 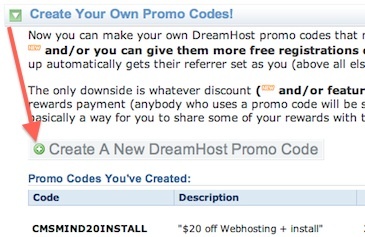 You can also create your own Dreamhost promo codes and give your guests or friends a discount on Dreamhost webhosting. If you choose to create your own promo codes, you will automatically be signed up for the one-time payment referral amount of $97. The discount that you give in your promo codes will be discounted off your referral amount. Previous post: What apps are available in Dreamhosts’ One Click Installs?